The fastest car you'll ever drive is one you don't own. This is certainly true on media test drives, where automotive journalists have a tendency to indulge in a bit of vehicular mayhem. After all, if you were in Spain and were given free reign to do whatever you wanted with a 550 horsepower Mercedes-Benz E63 AMG, would you drive it conservatively? No way. You have a duty to your readers to test the car's limits. It's called journalism ethics, people! The thing is, the local cops don't always understand this. 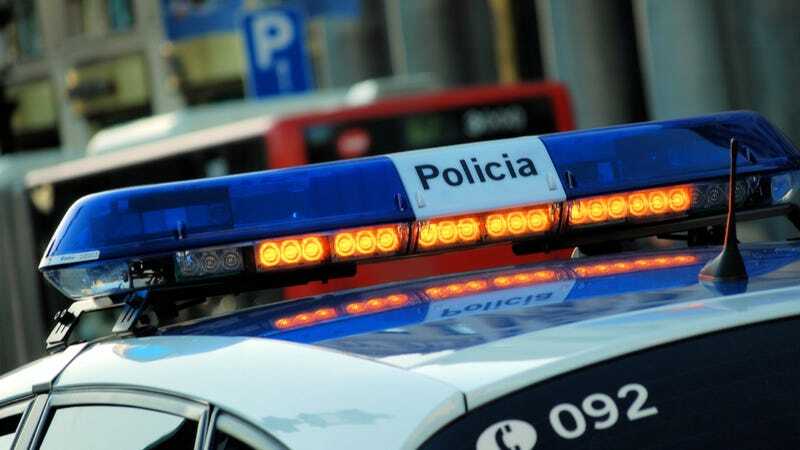 Such a misunderstanding happened with police in Spain recently on the aforementioned AMG test drive, where the policia impounded a group of American journalists for several hours, according to our pal Brett Berk over at Motoramic. The thing is, they weren't nailed for the usual reasons, like speeding or getting sideways in intersections. The Spanish cops got them for not having international driver's licenses, Berk said. I know what you're thinking now: Is an international license really a requirement when you do what we do? And the answer is no, it's generally not. It's also not a requirement for U.S. travelers as long as they have a license in good standing in their home country. Luckily, a local "fixer" and some Mercedes reps showed up and secured the release of the embattled autojournos — supposedly without any bribery involved, says a Mercedes spokesman — but the cars were left impounded. Hey, Spanish police — if you're getting tired of all those AMG wagons taking up space in your impound lot, I'd be happy to give one of them a good home. Just let me know.